If a 'soulmate' came in pink and steel- I can say that I have finally found mine! 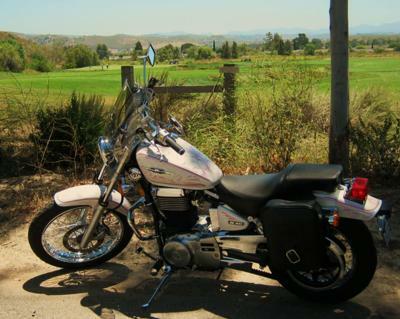 This is my LuLu LaRue.. She's an 05' Suzuki S40...LOVE THIS BIKE!! :) I'm a newbie, wet behind the ears, rider. My husband recently acquired a BMW R1100RT and his excitement about riding got ME excited- so I went out and got myself a little 1986 Honda Rebel 250. THEN went and took the MSF course- yeah, kinda put the cart before the horse, but what can I say- I was sooo excited to ride!! after completing the course, and riding the Rebel a bit- I came to realize that the Rebel was a bit 'cramped' for me--soooo it was time to do some online classifieds shopping! Found my LuLu in Henderson, Nevada...over 300 miles away! But after seeing her picture I KNEW I just HAD HAD HAAAAD to have her! So I talked the husband into a little road trip, rented a trailer, and we were on our way... She's been a DREAM to ride..If I had a bike custom fitted to my body it could not possible fit me better than Lulu does... She's has plenty of power for the little country rides we do and she's absolutely BEAUTIFUL with her custom pink and purple pinstripping..:) We've met so many cool people just from them walking up and asking about her...I can't wait to get even more hours and experience on her so that there's NO WHERE that we won't go!! Yep- at 43 years old, I think I FINALLY found something I have a true passion for..me, Lulu, and the open road...:) wheeeeeee!!!! Like your bike and love your story. I'm sort of like you. I'm 41 and went down to the dealer ship a week ago, forked out some buckos and had my husband drive my new bike home because I have yet to have a license. So now I have this beautiful bike that I can't take to the streets yet... YET. Today is the day I take my final test at MSF and I will finally be legal!!! Here's KNOWING I'll pass. She's a beauty. Congrats! Just wondering, why rent a trailer? Why not ride her the 300 miles home? It's only half a day's ride.